Majority of the TV screens manufactured in the past decade still do not satisfy customer tastes. The solution? Purchase a gigantic video projection screen and convert your home to a makeshift home theater. With most of these screens hitting the 150-inch size mark, get ready for a terrific viewing experience. Few activities engage the entire family like an indoor cinema, and it has to be said that digital projection is currently the hottest trend in this regard. However, it is relatively easy to forget that the projector screen used in projection is equally important to the image produced. For instance, a top of the line 8K/4K projector will definitely disappoint if it’s projected on a low-quality screen (Source). Just like projectors, projector screens have evolved exponentially. From manual projectors, which had a low display and were difficult to use, to the recent motorized projector screens that possess the latest display technology. New models of motorized projectors provide a thrilling experience and are easy to use. In this post, we will review our five highest-rated projector screen models. 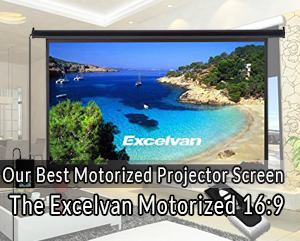 The Excelvan 120” Motorized 16:9 Projector Screen is number one on the list for a variety of reasons. It features a large screen, exceptional image quality and integrates seamlessly with any type of video projector. At 120 inches, the user is guaranteed an expansive viewing experience. It has received plaudits for being both sturdy and energy efficient. It comes with a 160⁰ viewing angle, which makes the projector screen suitable for both home and business purposes. The projector screen has a white screen with 1.2 gain matte plus 30mm black borders that masks it. It is also fitted with a control panel that can be wall-mounted so you don’t always have to use the remote. The screen is long lasting and easy to set up. It has an aspect ratio of 16:9 that guarantees an immersive viewing experience that will make your watching/presentation/gaming sessions very enjoyable. In addition, the surface is static, mildew resistant, and very easy to clean with water and mild soap. 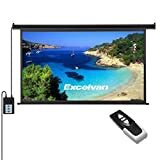 Homegear 110’’ HD 16:9 Projector Screen is a 110-inch screen projector with a gain matte of 1.3, an aspect ratio of 16:9, a 160⁰ viewing angle and measures 20.3 pounds in weight. The gain screen is mildew resistant, flame retardant and can easily be washed with water and soap. The projector screen features a 3-layered black border, which creates an ideal contrast by eliminating light penetration. The result is a top quality production, which provides crystal clear images for your home or office. The motor system of the projector screen is fitted with noise-cancellation features that make for a more intense viewing experience. Apart from that, it is energy efficient and requires low power consumption. It also comes with a control panel that can be wall-mounted, thus eliminating the need for a remote. Additionally, the projector screen comes with a durable steel casing with plastic white ends for ceiling and wall assembly. The projector screen is highly compatible with a number of projectors, and involves a simple plug and play system as it come pre-installed. 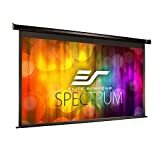 4K/8K Motorized Elite Screens Spectrum boasts of a high quality fire retardant material, a little bit slow to roll down but is a fantastic option for any buyer. Users enjoy easy installation and 2 year warranty guarantee. The projector screen features a 100-inch MaxWhite multi-layered weave material with a textured surface, a 1.1 gain, and a 180⁰ viewing angle. The screen comes with a detachable 3-way wall-mount swatch and an infrared remote to use during your operation. With the 4k/8k feature together with the 100’’ screen, the user of the Elite Projector Screen is guaranteed ultra-high definition images. If you are planning to buy a high-quality projector screen, this is the ideal one to purchase. The screen projector ships fully assembled, in a ready to roll-plug and play form. It is accompanied by a durable casing, which easily mounts onto the wall to ensure an easy installation process. It is also resistant to mildew and can be washed with water and soap. Best Choice Motorized Screen Projection is a 100-inch, lightweight projector screen measuring around 9 pounds in weight. It has a screen gain of 1.3, a 160-viewing angle and a 4:3 display ratio and comes with a 2 year warranty. The 1.3 gain and the 100’ screen plus 4-sided black masking border create a large clear image that is dynamic. Due to this reason, this projector can be used in many areas, including home cinemas, educational environments, as well as in business settings. The screen is made with anti-static and anti-acid fabric that protects it against dust and mildew. The result is a long lasting fabric that can be used for a long period. The fabrics are also easy to clean by use of mild soap and water, thus you can easily maintain your projector screen. The projector screen comes with a wall-mountable controller to operate your system. In addition, it comes with a remote that is used to operate the screen from a distance. The motor works silently to provide a silent environment suitable for your movies at home and for professional experiences as well. 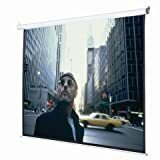 Safstar Motorized Projector Screen is a 100-inch screen projector with a gain matte of 1.3, an aspect ratio of 16:9, a 160⁰ viewing angle and measures 17.4 pounds in weight. The screen is designed with a white matte fabric that can easily be washed by soap and water. The 1.3 gain screen material has a typical black backing border that eliminates light penetration by creating a high contrast for optimum picture quality. The black backing borders are 4-sided to increase contrast and picture focus. The result is a vivid high-quality image. The projector screen is fitted with a silent motor system that possesses noise cancellation functions as you use your screen while also extending the operational longevity of the screen. It also has pre-wired power cords connected to an integrated switch which allows you to regulate the rise/drop settings. The remote controls that come along with the projector has an extensive radio frequency. This makes it easy for you to control your screen from a considerable distance. There are various factors that you need to consider before you can purchase your ideal projector screen. Firstly, you have to decide the purpose of your purchase. Will the projector screen be used for educational or recreational purposes? 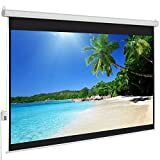 Is the projector screen being purchased for indoor or outdoor settings? Outlined below are some very important factors you need to consider before any purchase. Most people are thrilled with large screen images. In fact, when incorporated with a 3D effect, you will experience a real-time effect due to the virtual reality function compared to smaller screens. This is because bigger screen sizes have a larger view area. Most motorized projector screens range from 100 – 120 inches and that is a good range for an exciting viewing experience. However, bigger screen sizes are pricey depending on the quality of the material the screen is made of. Choose a size that works for you without putting a strain on your finances. Screen gain is the tendency of a screen to decrease or increase in the brightness of images usually caused by the materials used as the projection screen. It is defined as the ratio between a variation in brightness on a certain screen and the neutral/standard screen. A screen feature that shows images more brightly than the standard screen. Its gain will, therefore, be labeled with a number greater than 1.0 for example 1.3 or 2. 0. A screen with a gain of 2 is twice as bright as the standard/reference screen. However, brighter is not always better. Although high gain projector screens reflect brighter images, the image quality will drop significantly, as you move away from center-screen view. That means they have limited viewing angles. shows the images less brightly than the standard screen. Its gain will, therefore, be labeled with a number less than 1.0, for example, 0.8. A screen with a gain of 0.6 is 60% as bright as the standard screen. Low gain projector screens will reflect images with less brightness but can be suitable for rooms with little ambient light. Lower reflectivity allows a wide-angle view. The motorized projector screens generally have a slightly high gain ranging from 1.1 to 1.3. As we mentioned earlier, that is a relatively good range for projection. Therefore, you will have to choose the ideal gain that suits your needs. Another factor to consider is the color of your projector screen. There are only two options, grey and white. However, the majority of projector screens are white. However, a grey screen absorbs the light better than a white screen. This means that depending on the power of the bulb, the colors will seem more realistic on a grey screen than a white screen. If you are considering a white screen, we strongly encourage you to choose a grey screen instead. Is the measurement that describes the maximum angle for viewing images from the center of the screen. This means that you will be able to view your images clearly at various angles in your room with a projector screen that has a large angle of view. Unfortunately, high gain projector screens have a lower viewing angle. Almost all motorized screen projectors have a relatively high gain but it does not mean that they have terrible viewing angles. In fact, most motorized projector screens have a viewing angle of 160⁰(very few at 180⁰) which is ideal for both home and office use. Most electronic accessories are prone to unexpected dents and the same applies to motorized projector screens. 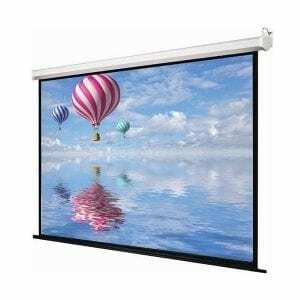 Hence, you must make sure that you are granted a comprehensive warranty package no matter how convincing the quality of the projector screen appears. Warranty serves to show that the projector screen is not only high quality but also the manufacturer is 100% positive about it. 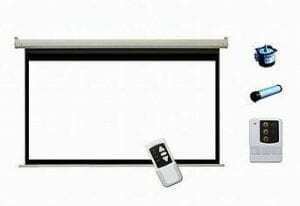 The advantage of a warranty is that it is easy to replace your projector screen in case of any faults. Most motorized projectors come with 1-2 years warranty, which is enough time to gauge the durability of any projector screen. 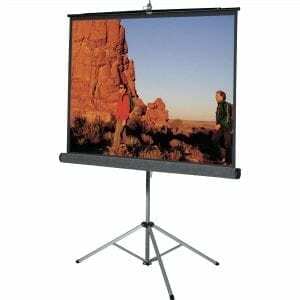 Different kinds of motorized projector screens are available at the market with varying prices. The price range is due to the difference in the quality of materials they are made from, the size of the screen, and the gain. Quality always comes at a price. This means that have to dig deep into your pockets to purchase a high-quality motorized projector screen. However, the majority of projector screens developed in recent times are of high quality. The difference in size and quality of the fabrics they are made from creates a gap between their prices. There are two types of projector screens: coated and uncoated projector screens. Regardless of its category, both screens will collect dust over time. This means that you must clean your screen regularly if you want to receive the best picture quality. 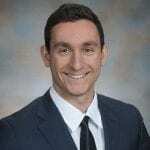 The cleaning strategies for coated and uncoated screens vary greatly. Make sure you read through the appropriate section below before cleaning your projector. Keep in mind that cleaning your screen improves your viewing experience and extends the lifespan of the product. The more dust you allow to accumulate, the higher the risk of your projector screen getting scratches. One final recommendation is that you should never use a projector or projector screen in a smoke-filled area. The smoke will ruin the air filter on your projector and reduce the quality of your projector screen over time. Ultimately, this will cost you more in the long run. While coated screens often offer a higher viewing quality, they can also be damaged more easily. Preferably, you should use microfiber cloths to wipe down the screen. Additionally, you should consider using a large cloth on a pole in order to wipe down your screen. This will allow you to reach a larger surface without straining yourself. When you wipe the screen, make sure you follow an up-down pattern, not side-to-side or in circles. It is incredibly easy to scratch your screen if you change direction often. If you notice the rag has a significant amount of dust on it, brush it off instantly. Wiping a dusty rag on your screen can cause more scratches. If the dust does not come off, get a new rag. One last note, do NOT use any sort of chemical cleaner on your coated screen. Chemical cleaners usually affect the coating on the body of the projector screen and cause scratches that ruin the projection screen. Uncoated screens are much easier to clean. You can simply use a damp rag to wipe down the screen. Once again, if the cloth gets too dirty, you should clean the cloth or get a new cloth to prevent scratches. Additionally, if you are having difficulty cleaning the uncoated screen, you can also use a mild soap on your screen. Make sure that this soap is incredibly mild and only use a small amount. You may want to test a small area of the projector first, to ensure that it does not cause discoloration of your screen in any way. The best motorized projector screens are expected to integrate seamlessly with your projector. This will provide you an extremely thrilling office and home viewing experience. The most important factors to consider when buying a motorized projector screen is the size, quality of the build materials, and the screen gain. In turn, this will determine the viewing angle. As always, make sure to take proper care of your screen. When making your final decision, pay attention to features like viewing angles, quality of projection, and more. What do you look for when buying a motorized projector screen? Share with us below!